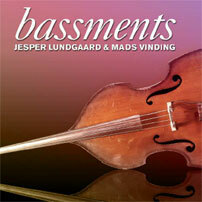 Following up their innovative album "Two Basses", Jesper Lundgaard and Mads Vinding continue to move forward with their amazing combination of imagination and technique. The sum of their four strings once again provide a broad spectrum of sound in an album dedicated to many of their sources of inspiration both past and present..
"Those Who Were" is a composition by Niels Henning Ørsted Pedersen. It refers to his remembrance of friends who passed away. Niels himself passed away in 2005 and we want to honour him by dedicating this CD to him. He was a leading star for both of us - showing us many new ways to play the bass and how to approach music. He was also a brilliant, humoristic and warm man whose primary target was to release control over the music and let it speak through the player instead. We miss his presence here with us. Some of the other tunes we have selected for this CD are also tributes to "those who were". Duke Jordan was living in Denmark from the beginning of the 70's. We both had the fortune to play and record with him, and we honour his memory by playing one of his finest compositions, "Jordu". Denmark has been blessed by many fine American jazz musicians who from the beginning of the 60's made the decision to stay in our country. The jazz community in Denmark has benefited a great deal from the inspiration coming from these fine artists. One of the true greats was the bass player Oscar Pettiford. He definitely had much to do with the fact that Denmark later became famous for its bass players. We decided to remember Oscar Pettiford by playing his beautiful ballad "Two Little Pearls", which he dedicated to his newborn twins Celeste and Cello. "Django" is composed by John Lewis - the piano player and leader of the Modern Jazz Quartet. Both of us have played with John and we had a great and educating time because of his way of interpreting a melody. Simple - but with the weight on the important notes. "I've Never Been In Love Before" was one of the late, great clarinet player Putte Wickman's favourite tunes, so in this way we decided to honour his memory. Bill Evans composed "Waltz for Debby". We both wish that we had had the chance to play with him. What a challenge that would have been! Some of our heroes are fortunately still alive. Roger Kellaway composed "I Have The Feeling I've Been Here Before". He's a brilliant, inspiring piano player and composer. Neither of us knew Richard Rodgers or Frank Loesser and neither of us have worked with Paul McCartney. But we listened a lot to their way of putting music together. Recording this, our second album together, has been a fun challenge for us. We learn a lot by playing together - and we hope that we have succeeded in making this CD even better than the first one. "What is better than a bassist featured on a record? Two bassists of course, especially if the two are the talented Danes Jesper Lundgaard and Mads Vinding. Both seasoned pros with enviable resumes and long discographies as sidemen for jazz greats, this is their second duo recording together, and it is a wonderful album, chock full of terrific bass playing and pleasing arrangements. The repertoire selection is excellent; there are jazz standards such as My Favorite Things and I’ve Never Been In Love Before; folk and pop tunes; and compositions by bassists – Lundgaard and Vinding, as well as Pettiford and Ørsted Pedersen. On the “pop and folk” side of things, the duo gives us two Swedish traditionals, Visa från Utanmyra and Emigrantvisa, these songs are woven into one arrangement and have a St. James Infirmary flavor. Sir Paul McCartney’s Blackbird rounds out the folk or pop selections. The duo’s rendition embraces the simple songfulness, creating a Country-type tune that transcends country or nationality, a beautiful “everynation” song. There are two somewhat obscure compositions by bassists, Oscar Pettiford’s Two Little Pearls, and Those Who Were by Niels Henning Ørsted Pedersen. The latter is one of the standout tracks on Bassments. Lundgaard and Vinding’s emotive treatment is almost Classical in style, and simply gorgeous. Among the standards here: a hip arrangement of My Favorite Things, a fun version of Jordu (which, of course, lends itself to duo treatment), Waltz For Debby, and a Roger Kellaway ballad entitled I Have The Felling I’ve Been Here Before. The bassist give lively, swinging playing throughout, and though between the two of them there are more chops than a butcher shop, they are never afraid to play simply, melodically – very tasty. Of course, the chops are good, too. Check out the two trading fours on I’ve Never Been In Love Before – yeah! These two capture a nice spirit on John Lewis’ Django, then turn around a few tracks later and get dirty on Vinding’s Gee Blues. The album closes with Jesper’s Samba, and from the sound of it, it takes two to Samba, as well as Tango – the duo lays down a great feel, a tricky thing to pull off in a bass duo. Vinding contributes a fantastic solo on this cut, as well. This terrific recording is not just a curiosity, or for bassists only, it is a fun, swinging record that would appeal to any jazz lover." Mads Vinding plays LaBella 7710 strings recorded with a DPA 4011 microphone. Jesper Lundgaard's bass is heard on the left and Mads Vinding's on the right.